I've read a lot of books that are kind of similar to this one, but more in the sense that there is a multiple personality disorder, not one sister pretending to be the other. I thought it was an interesting take and fairly well done. I am back with another book review, today it is The Secrets We Keep by Trisha Leaver. The story follows twin sisters Maddy and Ella. After having to pick up her sister at a party in the middle of the night, Ella isn't too pleased. She's still angry with her sister up until the minute she loses control of the car in the rain and hail. Next thing she knows, she's being pried out of the car by a paramedic and crying out for her sister. She wakes up in the hospital and initially remembers very little. But when her sister's boyfriend shows up, she knows they've made a mistake. She's not Maddy, she's Ella. But everyone is so happy to see her, to see Maddy, that she plays along. 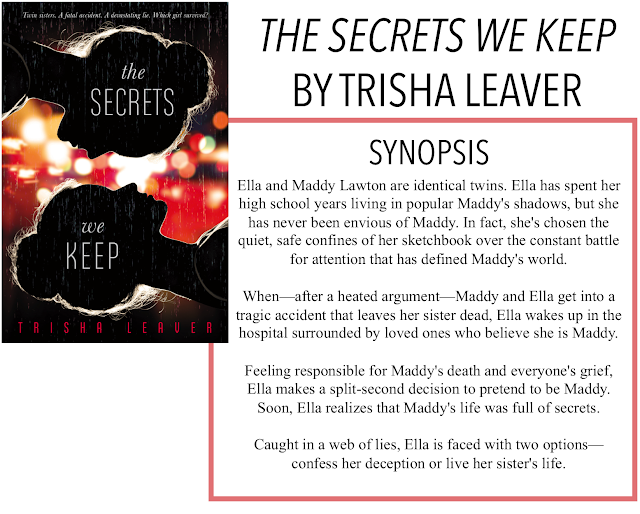 Going into this book, my biggest concern was wondering if Leaver was going to get the whole pretending to be Maddy thing to be realistic. Was she just going to wake up and decide, hey, my sister's life seemed pretty good, let's just switch? Or was there going to be an unconscious/made for her choice where she's Maddy because they say she is and everyone's favourite plot device amnesia does the rest? What actually happened was somewhere in between, and I would say fairly believable. I've said it before, and I'll say it again, I think I'm getting too old for this high school drama. The last couple books I've read have been in high schools so I think I've just reached my threshold. Life goes on beyond being an irritating jerk in high school. Some of the things Maddy and her 'friends' said and did were just terrible. That being said, not much really happened outside of the high school drama and the whole Ella-is-Maddy thing. Her parents were, as expected, fairly absent from the story, occasionally popping in to spread some grief and talk about how Maddy/Ella should go to therapy. They couldn't even tell who was who. I suppose, if we give them the fog of grief benefit of the doubt, I could see it, but after a month, you couldn't see differences in mannerisms? They're twins, not the same person. I know everyone grieves differently, but I just feel like Ella's decision was kinda dumb. Her whole thought was that she (Ella) should have died in order for Maddy to live, not Ella should live and Maddy should die. It's kind of confusing and a little backward. I think we didn't see enough of how perfect Maddy was to warrant readers being fully on board with the switch. It's not like their lives were that different, and Ella didn't really seem all that jealous of Maddy's friends. I get trying to make your sister come alive again, but in the end, one of you is still dead. I think the end kinda wrecked this for me. We kind of skip the part where everyone gets mad about Ella pretending and nobody makes a big deal about it. I was expecting some yelling, some anger, even some sadness that they buried the "wrong" sister. But we got nothing. Overall, I wanted to like this book more than I actually did.